The apparent decision by the Committee on Discipline last week to revoke the diploma of graduate Charles Yoo ’98 for five years raises disturbing questions about the disciplinary process employed by that committee. Whether the action was warranted remains a mystery to all but those present at the hearing; the highly confidential nature of COD hearings has prevented the revelation of much pertinent information to the student body. More frightening than the action against a particular individual is the arbitrary, clandestine, and possibly unjust nature of COD proceedings revealed by this action. The revocation of one’s diploma after one has graduated is perhaps the ultimate disciplinary action which can be lodged by the Institute. Clear codes and rules of conduct, not vague, wispy, and changing guidelines, must dictate these grave proceedings which mete out such severe punishments. In addition, when such serious charges are lodged, the defendant must have every opportunity to challenge his accusers and assert his innocence -- such proceedings are the cornerstones of the American legal system. If we are to believe Timothy Burke, Yoo’s lawyer, there is a fundamental lack of due process in this disciplinary action. Burke told the Boston Herald that he was not allowed to speak as Yoo’s counsel, nor was Burke allowed to ask questions of the board or witnesses. The COD itself has readily admitted to the fact that it does not allow a lawyer to speak on a student’s behalf. 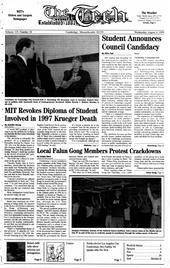 Of course, we cannot automatically take Burke at his word and would like to hear MIT’s responses to his allegations. Such responses need not delve into the specifics of the case, which by federal law must remain confidential. Instead we ask only for the outline of a disciplinary process to which all students may be subject. MIT has a responsibility to inform students in clear detail about the specifics of the process, such as whether counsel is allowed to speak. The defeaning silence from MIT brass, however, does not dispel the claim by Burke that the COD employs “Star Chamber” tactics. We would have liked to express our editorial opinion on whether the action against Yoo was justified in this space. However, thanks to the absence of relevant procedural information which MIT has decided to share with its students, that is not possible. It’s time for MIT to give students a clear and finely detailed explanation of how such decisions will be reached.